India's Hindu right which has been traditionally sympathetic to the monarchy and opposed to Nepal going secular is split about Nepal policy. There are differences in approach between the Rastriya Swayamsevak Sangh (RSS) and the Bharatiya Janata Party (BJP). about the political approach to Nepal. The RSS is reassessing its past policy on the future of the monarchy and say putting all their eggs in the royal basket was not a wise move. Besides being a Hindu king, they believed only the king could fight the Maoists. Now, senior RSS leaders admit the erosion of the king's credibility in Nepal has damaged them as well. We depended on proximity with the king for our influence, now with the king gone we have lost our strength on the ground," one senior RSS leader told us. Despite this, the RSS would like the institution of monarchy to remain. While more radical groups in the Vishwa Hindu Parishad still hope for an active monarchy, most in the Hindu right in India know that the days of an assertive king are gone. "We would be quite happy if the institution remains, it is a symbol of unity and is the only Hindu monarchy in the world. We know Gyanendra and Paras are unacceptable but then the grandson formula could work," says an RSS leader who has tracked Nepal for decades. BJP leaders, including Atal Bihari Vajpayee, have said they will not actively push for retention of monarchy, and will decide on their stance based on the public mood in Nepal. The rightwing in India has kept the channels of communication open with king Gyanendra who has met three intermediaries in the past few months: a former minister from Tamil Nadu close to the RSS, a journalist with a Delhi-based pro-BJP paper, and a former intelligence official. All have returned with the impression that the king is relatively calm but at a loss about what steps to take. It appears he has been advised that a four month retreat, possibly a pilgrimage to India, would be in his interest as this would take the sting off criticism that he is obstructing elections. More than saving the monarchy, the RSS wants to contain and curb Maoist influence and begin a political campaign in favour of reverting to a Hindu state. It is on these two issues they are willing to invest energy and capital, not on the monarchy. Utterly convinced of Maoist insincerity, the Indian right is, contrary to popular perception, keen on constituent assembly elections. The RSS is convinced that the Maoists would fare miserably and see the polls as the right way to expose them. They believe that Maoists are keen on derailing polls and using the ensuing uncertainty to organise violent street agitations. Like many others in India, the RSS was happy with the madhesi movement because it eroded Maoist support along the border. On the ground, especially in Raxaul and Gorakhpur, some RSS activists provided support (political, logistical, and possibly, limited financial help) during the movement through the Seema Jagaran Manch, a front organisation. Upendra Yadav has met senior BJP leaders in Delhi through RSS interlocutors. But this support is limited and they neither have the will nor capacity to drive the movement. "We realise there is limited benefit for us out of the madhesi agitation. There is a crisis of leadership. Upendra Yadav is playing too many games with too many people and can't be trusted. No madhesi group is willing to boldly say they are for a Hindu state. "What's in it for us?" asks an RSS activist. The RSS' opponents tend to over-estimate its strength, and even the RSS leaders know their capacity to influence domestic politics in Nepal is limited. 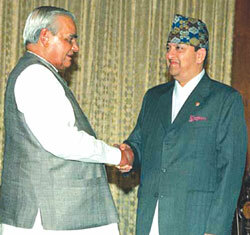 But its leaders are aware there is strong sentiment in Nepal opposed to secularism. For now, the Hindu right in India is waiting for a strong anti-Maoist leader with a popular base who can publicly declare he is for a Hindu rastra.